THE previous post reminded readers that EPO budget travels a long way in promotion of UPC — to the point of sort of bribing the media to play along and set up pro-UPC events, perhaps even produce these habitual UPC puff pieces. Is this what EPO stakeholders, who are paying this money, prefer to see it spent (wasted) on? Corrupting European media to play along with Battistelli, which only 0% of stakeholders tolerate anyway? The US patent system looks like an ethical angel compared to the EPO. Not too long ago we wrote about Managing IP organising pro-UPC events with stacked panels [1, 2, 3, 4, 5]. All those fake news articles on the subject are apparently not enough [1, 2, 3, 4, 5] and as scheduled, coinciding with Battistelli's surprise lobbying trip to the UK (last week), Managing IP does it again! Shame on Managing IP, who are not even good at hiding their motivations and intentions. But never mind facts. The UPC echo chamber is just there to googlebomb the whole Web with misinformation and self-serving propaganda. 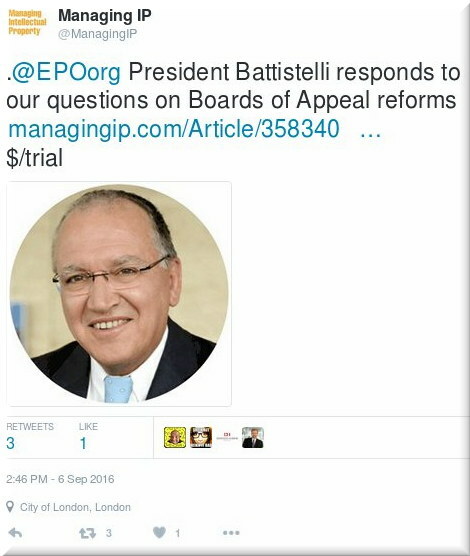 Battistelli supplies a lot of money for this propaganda and he wants to get his (actually, EPO stakeholders’) money’s worth. Obviously, as an outsider might expect, the event was so full of too much one-sided ‘information’ that quoting anything from it would only do harm (without detailed rebuttals). Facts are not convenient to them, but lobbyists try to just make up the law and spread fake news to that effect. That fake news is music to their ears. Garbage in, garbage out. Where are the opposers to UPC? Oh, that’s right, they were not invited. And even if they managed to put together a lot of money to actually attend (it’s expensive, about a thousand pounds! ), they would receive no speaking position. Opposition is not allowed. It’s a lobbying event and its target audience is British officials and other members of Team UPC, who already drink the Kool-Aid and wish to share it with others. This, in our view, represents not just lobbying but institutional corruption if not collusion between parties that look to gain behind closed doors, not because it’s acceptable but because they’re allowed to get away with it. We suppose that Team UPC and CIPA feel greatly empowered in the EPO’s presence, as though they almost inherit the same immunity and impunity Battistelli gloats and brags about. That’s something that we in the UK never had. Now, see the comment in there (Twitter), about “posters” in Ireland…. Sadly, a lot of people in the UK don’t grasp patents and the UPC. “Scientists for EU”, for example, wrongly/erroneously chose to view opposition to the UPC as some kind of UKIP thing (maybe because of the source of some articles about it). ECJ being involved serves to remind us again that Brexit and the UPC simply cannot coexist, and patent maximalism at Battistelli’s EPO threatens to intrude EU member states. Who would want that except patent lawyers and large clients like international pharmaceutical giants, lovers of broad and harsh injunctions? When it comes to patents, it is a benefit because it makes the UK more attractive as a safe haven from something like the UPC (if something similar ever becomes a reality outside the UK).